Boredom creeps up in Searching—the new desktop mystery directed and co-written by Aneesh Chaganty, starring John Cho—in a way it doesn’t with the other Timur Bekmambetov-produced New Media experiments, Unfriended and Unfriended: Dark Web. Maybe because Searching feels significantly less organic, or less challenging, because of its conceit: A widower father goes on the hunt for his missing daughter, sifting through digital breadcrumbs on her laptop. Where the Unfriended films had to contrive drama from nothingness (in a good way), Searching seems a bit less savvy. In spite of an opening sequence that shows us just how much this family’s life was documented digitally, all the familiarity of being an amateur computer detective the film boils down to rote action. What’s interesting about Searching has less to do with what it does and says in its own right, and more a product of how it has to function as a desktop film, where psychological motivation can be both literalized through “action” (clicking, scrolling) and occupy a liminal, digital space without “action” (hovering over a word or page). Its perfunctory tagline “We Are What We Hide” is somewhat a misnomer—or a red herring. Sure, as a digital procedural, Searching bends around twists and turns, which are engaging enough, but they’re less likely to give insight into, say, the various personas that are created and maintained in a globalized, internet addicted cultural landscape, and more supposed to function like a mediocre plot point in a mystery context. Finding out that the missing daughter, Margot (Michelle La), stopped going to piano lessons or transferred $2,500 to Venmo is less compelling than it should be, and the film struggles to make a point about how, well, normal it is to leave a digital papertrail when you’re doing anything online. Searching can barely make the case, coherently at least, that performing different versions of yourself, even depending on your online audience, is aggressively familiar. If this all seems somewhat obvious territory for anyone who’s created a finsta or an alt Twitter account, Searching is “shot” with blinkered naivete. 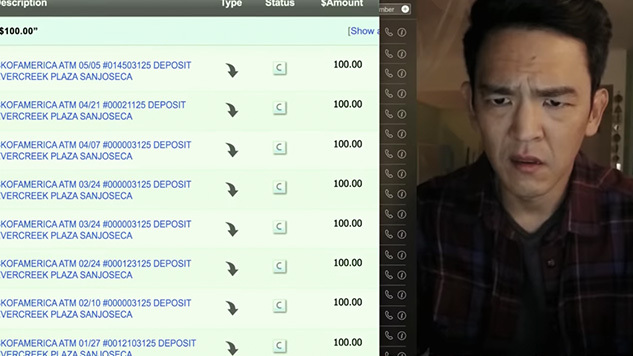 John Cho, doing his best, plays David Kim, who is amazed and appalled at almost everything he comes across online. Maybe most interesting about this film is that it is not, like Unfriended, a film from the perspective of “digital natives,” but about a digital native from the perspective of someone who isn’t. There are zooms on certain words, or tabs, or buttons, and any number of subtleties that could come organically from watching what’s happening on the desktop naturally are amplified to handholding levels of obviousness. Slow zooms into certain parts of the screen hammer home basic ideas or plot points, and music undermines much of the drama. Less a natural extension of the procedural or missing person drama or desktop film, Searching is for people who’ve been underestimated as far as their ability to trust a newish mode of filmmaking. Time is compressed unhelpfully in Searching; much of the pleasure of the desktop film, is its relationship to time, how such films can be kind of boring or quotidian. In Searching, everything has a motor, a drive, from Point A to Point B that basically squanders most of what’s interesting about the mode in which the story is told: no extra windows, barely any extra tabs, little multitasking. Even in desperation, there isn’t a frantic or real nature to any of this. It is mechanical in the worst way. Perhaps this is frustrating because Searching has little mind for the pleasures of the procedural. From Agatha Christie to Law & Order the fun of the genre is, yes, the procedure. It’s not exactly of interest to watch, say, a Google Sheets doc fill up at breakneck speed with somewhat cloying uses of FaceTime to get Cho’s ever-nonplussed face on screen. What desktop films offer is an insight into the tedium, the very everydayness of living in a digital world, and the processes offered by mystery should give that tedium a more specific goal or trajectory, not eliminate it. If the film’s understanding of how alternate lives are created online is fairly sophomoric, can Searching give insight into how grief functions online? Not really. There’s something to be said about how Chaganty intimates towards a society inclined to memorialize and digitize everything, giving the impression of a digital life after death (remember Black Mirror: San Junipero? ), Searching points to a future where people, as well as cultural artifacts, acquire an immemoriality, though it shakily does this via the nostalgia of walking through the litany of user interfaces that have become backdrop to everyday lives. But the easy access and prominence of the past occupying a space outside of conventional time structures is rarely revisited in the film, particularly if it endeavors to show how grief and digital landscapes either shape or become an avenue of expression and identity. Searching offers compelling curiosities, to be sure: the way that virtue signalling or performed sympathy can go viral; the preponderance of online comments; the narratives crafted by online news sources; the sameness in the air of uniqueness of online photography; the selective vulnerability for certain platforms over others. Rather than integral parts of the film, these ideas often operate like lucky window dressing, the world not necessarily as fleshed out or as idiosyncratic to the Kim family as Chaganty perhaps intended. Maybe part of the success of the Unfriended films and the short film “Noah” (there aren’t enough reference points for this burgeoning sub-genre, but you do have film scholar Kevin B. Lee’s Transformers: The Premake) is the normality it insists upon establishing. There is enough time between, before, after, during the “drama” that the most uninteresting things must be maintained to give a sense of rhythm that approximates the reality of being on a computer. Part of Dark Web’s plot is hinged on maintaining an artifice of normality. Searching rarely indulges in that—or even the pain of anxiously checking a page for an update (save for its final scene). The whole “moral” thesis or ideology of Searching, antithetical to Unfriended: Dark Web’s, is ironic: It’s kind of stupid to hyperdocument yourself online. We sacrifice privacy and agency to sustain digital identities. But then Searching argues that: Maybe it’s good that these platforms exist, just in case you need to follow digital breadcrumbs if someone goes missing or something. Still, Searching sidelines the creation of different online personas, and the complexities of sustaining those realities, in favor of a subpar mystery never really able to take advantage of its form beyond the basic appeal. Will desktop films become the new found footage films, a mode of filmmaking hesitant to delve into the possibilities of the format and use it to examine complex ideas about society, identity and technology? There’s only subtext in Searching about Asian-American identity and the online experience—uh, is it supposed to be about a young Asian-American girl defying expectations of perfection by…quitting piano? What are going to be the limits of the desktop film if a procedural like Searching can only accomplish the bare minimum of being a watchable movie? Were the Unfriended films a fluke, or can you also have a desktop drama with dynamism, or a desktop romantic comedy exploring the essential tiny habits of our characters? For now, Searching is about as constructive as a 404 error.